[O]nce the science is perfected, such reactors are potentially far less costly to build per unit of electricity generated than traditional nuclear power plants. This is no small matter, as upfront capital expenses form the largest cost of nuclear power, skewing its competitiveness with coal. The design [Akme] chose is peculiar for being cooled not with water but a molten lead alloy. In fact, the Soviet Union was the only country to deploy liquid metal reactors at sea. Introduced in the 1970s, they packed enough power to propel submarines more than 45 miles, or 72 kilometers, an hour under water. In fact, they were so powerful they compelled NATO to design an entirely new class of torpedo just to have a hope of hitting the new submarines, known as the Alfa Class. Today, hardened liquid metal reactor cores litter the Arctic. While small, they still weigh hundreds of tons. No facility exists to melt out the lead alloy, which is itself lethally toxic, and extract the spent fuel rods. 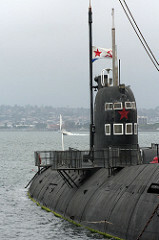 They remain an unsolved legacy of the Soviet submarine program; several are stored at a naval yard in Gremikha, on the Arctic Sea near Norway, according to Bellona. The waste issue seems like a huge problem here. In a typical reactor, spent fuel is removed from the reactor and stored separately. Few countries have really figured out how to dispose of their radioactive waste once and for all, but at least it's doable in theory (building a long-term geological repository is technically feasible, even if it's politically thorny). By contrast, with these old Soviet sub reactors, the spent fuel and reactor were often just frozen together in one piece. The plan? Wait until someone dreamt up a clever engineering scheme to process the waste. And they're still waiting.